French President Francois Hollande says he will stick to a plan to impose a super-tax on soccer players’ salaries despite the threat of the nation’s pro clubs to scrap games one weekend next month. 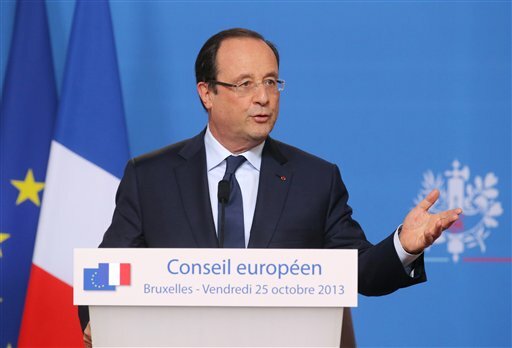 Hollande told reporters at Friday’s European Union summit that “the law must be the same for all” once the plan to implement a so-called 75-percent tax law on income above 1 million euros ($1.38 million) per year is approved. The law would mainly affect the clubs rather than the players, as it is geared toward making employers bear the tax burden. Jean-Pierre Louvel, president of the Union of Professional Football Clubs, says the law would be “the death of French football” if it is pushed through. His union has threatened to boycott games in the league round scheduled for Nov. 29 through Dec. 2. Hollande said he was willing to meet with the clubs next week to address their difficulties but said he would not budge on their main complaint. The last time games were boycotted in the French league was in 1972, but that was at the initiative of the players. The tax was a campaign promise from Hollande, who pledged to rein in what he said was excessive executive pay out of line with the struggling economy. The tax is only supposed to be in place for two years, starting retroactively this year, and the government expects it to net 420 million euros ($580 million). It would cost clubs 44 million euros ($60 million) over that period. The proposal for such a tax hike was the most memorable promise of Hollande’s campaign, and polls have shown it was widely popular, even if it generated heavy criticism from business leaders and sports organizations. Hollande’s initial proposal called for individuals _ in the case of football, the players _ to pay a 75 percent tax on all income over 1 million euros. That tax was rejected by a court this year and the budget currently before parliament would instead put in place a 50 percent tax, paid by the employer.